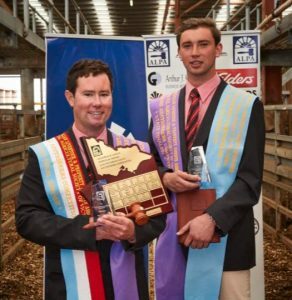 The 2017 Victorian Young Auctioneers Competition winner Elders Swan Hill agent Toby Newnham, left, with then Elders Camperdown agent Jack Hickey. THE annual ALPA Victorian Young Auctioneers Competition will feature 10 of the state’s top young livestock sellers in Pakenham next month. The 2017 Australian Livestock & Property Agents Association competition will be held at the Victorian Livestock Exchange for the fifth time at 10.30am on September 11. The competitors this year include Joe Allen, Elders, Euroa; Murray Bennett, Landmark, Wangaratta; Tom Davies, Rodwells & Co, Wangaratta; Nick Farley, Landmark, Bendigo; Tim Gibson, Alex Scott & Staff, Korumburra; Matt Jones, Elders, Mortlake; Lachlan McAllister, Elders, Bendigo; Pat McKinnon, HF Richardson & Co, Ballarat; Matt Rowlands, BR&C Agents, Mildura/Swan Hill, and Zac van Wegen, Kerr & Co Livestock, Hamilton. ALPA said the competition has gone from strength to strength in this location and is very highly regarded throughout the industry. Competitors will auction commercial cattle that have been sourced locally from the Pakenham Stock Agents Association. The cattle will be judged prior to the competition as a part of The Royal Agricultural Society of Victoria (RASV) – Prime Stock Competition. The competitors were selected at an ALPA auctioneers school held in Bendigo earlier in the year. The two-day auctioneers school provided auctioneers with an opportunity to develop and improve their auctioneering skills. ALPA said the school attendees received valuable feedback from experienced auctioneers and auction specific tips in relation to voice conservation and care from speech pathologists. One of the association’s main objectives is to provide relevant training programs to its members and the longevity of these competitions is a testament to the education ALPA provides. The 10 finalists will be competing for the title of 2017 ALPA Victorian Young Auctioneer as well as the Graham Lanyon Shield. The winner and runner up of the competition will go on to represent Victoria at the 2018 ALPA National Young Auctioneers Competition, held at the Sydney Royal Easter Show. The night before the competition, industry members and friends and families of the competitors, will gather to attend the annual ALPA Victorian Young Auctioneers Dinner. The dinner is a celebration of the young auctioneers and the agency industry. A highlight of the night will be the charity auction hosted by last year’s ALPA Victorian Young Auctioneers winner, Toby Newnham of Elders in Swan Hill. The funds raised from the charity auction will be donated to the John Logan Foundation, a not-for-profit charity that offers financial support to people diagnosed with cancer. The Foundation assists by contributing to the cost of prescribed treatments and procedures that are not available on the Pharmaceutical Benefits Scheme. The event can be watched live at the VLE or via a live video stream. The competition will be livestreamed with the support of Stock and Land and the RMA Network.